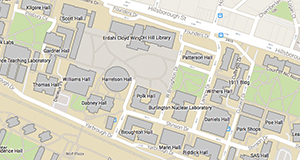 Zakikhani, P., Zahari, R., Sultan, M. T. H., and Majid, D. L. (2016). "Thermal degradation of four bamboo species," BioRes. 11(1), 414-425. Bamboo, among other natural plants, has a special structure, with different characterization along the culms and between species. In this study, the thermal stabilities of four bamboo species, named Dendrocalamus pendulus (DP), Dendrocalamus asper (DA), Gigantochloa levis (GL), and Gigantochloa scortechinii (GS), were investigated by thermogravimetric analysis (TGA) and differential scanning calorimetry (DSC) under a nitrogen atmosphere. Each species was divided into three different portions: bottom, middle, and top, and fibres were manually extracted from the specified sections of each species. The thermal analysis of extracted bamboo fibres indicated that the thermal degradation behaviour of each bamboo species varied from bottom to top and between species. However, these variations were lower in DA species compared to GS, GL, and DP, because of minor differences between lignocellulosic components of its three portions. The top and middle portions of the four species degraded at a higher temperature range (314 to 379 °C) than the bottom portions. The results of this study suggest that DA and GS species, according to their thermal stabilities, are most suitable for use as reinforcement in composite materials. In recent years, natural plant fibres have attracted the attention of engineers and scientists to employ them as potential reinforcement in composite materials because of their low cost, renewability, and sustainability. Natural plant fibres are divided into seven categories: wood, leaf, stalk, seed, bast, fruit, and grass/reed fibres (Jawaid and Khalil 2011). The properties of these fibres can be determined by the relative ratios of their four main constituents: cellulose, hemicellulose, lignin, and pectin (Saheb and Jog 1999). Cellulose, hemicellulose, and lignin define the reinforcement, degradability, and rigidity of the plant fibres, respectively (Zakikhani et al. 2014b). Lignin, in comparison with the two former components, is more thermally stable (Saheb and Jog 1999). The thermal stability of natural plant fibres that are used as reinforcement composite materials for various applications, especially in the aerospace industry, is a critical issue (Eldridge 2013). Therefore, thermal analysis of plant fibres needs to be widely investigated to increase the applicability of natural fibres as environmentally friendly bio-composite materials. In the category of natural plant fibres, bamboo culms belong to the grass family Poaceae, subfamily Bambusoideae, tribe Bambuseae (Yu 2007). It is estimated that more than 1000 bamboo species from 70 genera grow abundantly in Asia, South America, and other diverse climates (Gratani et al. 2008; Khalil et al. 2012). Peninsular Malaysia, as a tropical state, has approximately 59 bamboo species from approximately seven genera: Dendrocalamus, Gigantochloa, Racemobamboos, Bambusa, Schizostachyum, Dinochloa, and Thyrsostachys (Forestry Department of Peninsular Malaysia 2013). Bamboo culms, in comparison to other natural plant fibres, possess several advantages, such as low cost, low density, high stiffness, high mechanical strength, and atmospheric carbon dioxide fixing (Zakikhani et al. 2014a). Among the different types of renewable plants, it is almost the fastest growing one (Ray et al. 2004). The thermal properties of natural fibres used in reinforced composites can be analysed through various methods. The two most common methods that are used by researchers are thermogravimetric analysis (TGA) and differential scanning calorimetry (DSC). The TGA technique measures the weight loss and mass change of a substance as a function of temperature. However, there are some reactions that may occur with no mass loss. In this case, DSC is able to detect these reactions (Haines 2002). In one study the thermal stability and degradation of banana fibres in two sizes of macro fibres and nano fibres-reinforced composite were studied. The researchers found that thermal stability of the fibres increased from the macroscale to the nanoscale (Thakur and Thakur 2014). Thermogravimetric analyzer coupled to mass spectrometer (TGA-MS) was used to investigate the small scale of binders (lime or plaster) and cereal straw fibres (wheat and barley) as construction materials. The results revealed that in thermal degradation procedure the binders influenced the delaying of char formation of the composite (Chetehouna et al. 2015). On the other hand, the thermal stability of natural plant fibres has a significant effect on the fabrication process of natural fibre-reinforced composites (Mohanty and Nayak 2010). It has been revealed that the thermal properties, heat resistance, and heat distortion temperature of bamboo fibre-reinforced polylactic acid (PLA) composites were improved by the addition of bamboo fibres (Shi et al. 2012; Tokoro et al. 2008). The cellulose structure and non-cellulosic components are particularly effective at increasing the thermal stability of natural fibres (Ouajai and Shanks 2005). Although bamboo fibres exhibit stability that is appropriate for use in reinforced polymeric composite materials, they have different properties due to variation among species. In addition, the fibre percentage along the wall area of a bamboo culm increases from the bottom to top portions (Londoño et al. 2002). In the process of bio-composite preparation, thermal analysis of natural fibres is important due to the fibres’ limited thermal stability during composite development. Bamboo fibre composites are fabricated using various methods, such as hot press, cold press, injection moulding, and moulding techniques (Zakikhani et al. 2014b). Heat is used in different manners during all of these procedures; therefore, it is essential to ensure that bamboo fibre-reinforced plastics have the ability to conserve their properties and withstand the heat typical of composite preparation. 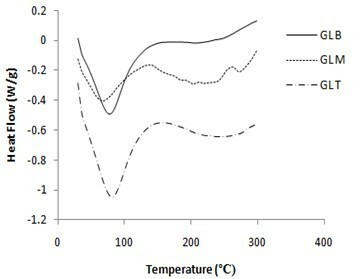 In this regard, the thermal stabilities (especially thermal degradation) of four different bamboo species, namely, Gigantochloa scortechinii, Gigantochloa levis, Dendrocalamus asper, and Dendrocalamus pendulus, divided into three sections each, were investigated using thermogravimetric analysis (TGA) and differential scanning calorimetry (DSC). Four-year-old bamboo species Akar (Dendrocalamus pendulus: DP), Betong (Dendrocalamus asper: DA), Beting (Gigantochloa levis: GL), and Semantan (Gigantochloa scortechinii: GS) were collected from Pahang in Peninsular Malaysia. The chemical composition of the bamboo species from literature are given in Table 1. The selected bamboo culms were cut 150 mm above the ground level. The four bamboo species were subdivided into three equal portions: bottom (B), middle (M), and top (T). The length of each of the portions was determined by the length of the species. Tree Wound liquid, a pruning sealer, was applied to the cross-section of every bamboo culm to prevent moisture loss during transportation. Bamboo nodes were removed using a wood saw to cut 2 cm above and 2 cm below the diaphragms. The separated internodes of DA, DP, GS, and GL species and their bottom, middle, and top portions were cut into strips using a cast iron bamboo splitter. The bamboo strips were labelled and bundled separately. Then, the separated bundles were kept in water for 72 h to soften the structure of the bamboo strips. After three days, the bamboo strips were removed from the water and were sliced longitudinally into thinner lumber strips. Subsequently, the fibres were manually extracted and air-dried. The prepared samples are shown in Fig. 1. The thermal stability and composition of the initial samples were assessed using a Mettler-Toledo International Inc., USA (TGA/SDTA851e) device under a flowing nitrogen atmosphere (10 mL/min) to prevent unwanted oxidation. The temperature range of the process was from 25 to 700 °C at a heating rate of 10 °C per min. The samples were placed in platinum pans with an average weight of 10 mg. 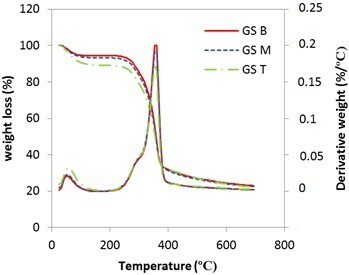 Differential scanning calorimetry was conducted using a Mettler-Toledo International Inc., USA instrument (DSC 823e) device to obtain thermal changes in the samples at a heating rate of 10 °C per min with a temperature range of 30 to 300 °C. The calorimetric measurements were performed under a nitrogen atmosphere at a 10 mL/min flow rate; 6 mg was the average weight of the samples. The differences in thermal degradation, characterised by peak temperature and weight loss, for all bamboo species (Dendrocalamus pendulus (DP), Dendrocalamus asper (DA), Gigantochloa levis (GL), and Gigantochloa scortechinii (GS)) and their divisions (bottom, top, and middle) are shown in Fig. 2 and Table 2. The first stage of weight loss, that is, the dehydration phase, was dependent on the temperature ranging from 25 to 150 °C; this stage was attributed to moisture evaporation from the bamboo fibres. The DTG plot, which compares the rate of mass loss during the temperature scan, exhibited a distinct peak for this phase (Biagiotti et al. 2004). The amount of moisture in a bamboo culm varies between species, in individual culms within same species and in different parts along the same bamboo culm (López 2003), and this resulted in different weight losses during this stage. The weight of bamboo fibres decreased because of the loss of moisture and release of bound water. The highest weight loss (10.8%) was observed for DP B, and the lowest was for DP T (4.77%). Following the dehydration stage, the rate of mass loss was rapid in the next zone (157 to 357 °C), determined as active pyrolysis stage which may correspond to the decomposition of hemicellulose, cellulose, and lignin components of the four bamboo species (Mansaray and Ghaly 1998; Kumar et al. 2008). The TGA curves displayed the decomposition of hemicellulose at first and degradation followed with the breakdown of cellulose. The lignin components decomposed slowly over the entire temperature range, which typically started at 100 to 900 °C (Yang et al. 2007). In the next stage, the rate of mass loss was slow due to the minor order of the reaction. Hence, this zone is defined as the passive pyrolysis region (Kumar et al. 2008). DA and GS exhibited two decomposition stages from bottom to top, compared with DP and GL; an exception was DP B, where there were only two stages of degradation. In the first degradation stage, the mass losses that began in DP M, DP T, and GL species were negligible between temperatures of 157 to 187 °C. Therefore, heating continued into the second stage of weight loss for DP M (7.41%), DP T (9.14%), and GL (B: 13.76%, M: 8.06%, and T: 14.19%). The weight loss percentage of bamboo fibres varied among the species and their bottom, middle, and top sections. The DTG curves of the zone between 315 and 700 °C displayed a single noticeable peak for all species. In Fig. 2, it can be seen that thermal degradation for all bamboo species occurred at higher temperatures but over different ranges because of the thermo-chemical changes of hemicelluloses in the four species. Hemicellulose is a heterogeneous polymeric network that has an amorphous structure and, in contrast with cellulose, has a lower molecular weight; therefore, it degrades easily at low temperatures (Yang et al. 2007). It decomposed in DP T at a temperature as low as 204 °C; however, the decomposition of DA T occurred at the highest temperature (296 °C). Moreover, the highest weight loss occurred in DA T at 14.91%. This indicated that the top section of DA has higher cellulose content than the other bamboo species. In all four bamboo species, the cellulose structure degraded at a higher temperature because of its higher thermal stability compared to hemicellulose. 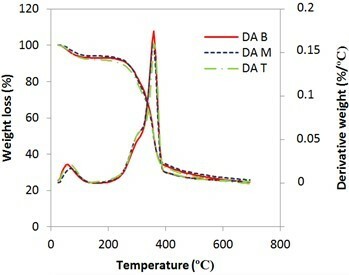 The starting points of hemicellulose decomposition in both DA and GS species and for all three sections were higher than 200 °C; however, GS B and T fibres decomposed at higher temperatures (210 and 223 °C) than DA B and T (200 and 215 °C). 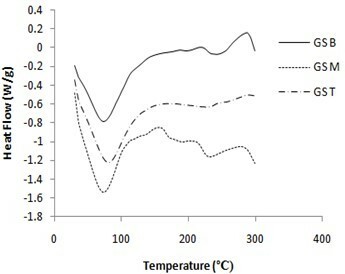 Additionally, the middle part of GS decomposed at a lower temperature than DA M. Meanwhile, the onset degradation of DP B occurred after 243 °C, which was the highest temperature among the four species. Following the hemicellulose degradation stage, but in the same phase, cellular breakage was observed as the third thermal degradation for DP M, DP T, and GL (B, M, and T) occurred at maximum temperatures of 356, 352, 353, 352, and 356 °C, respectively (Razali et al. 2015). Cellulose, in contrast to hemicellulose, is a long linear chain of polysaccharides; hence, it is more thermally stable. In Fig. 2, it can be seen that the major weight losses of bamboo species occurred above 340 °C and were approximately 40% to 62%. The second degradation of DA, GS, and DP B was observed from 292 to 378 °C and corresponded to the decomposition of cellulose and lignin in the fibres with the highest weight loss of approximately 47% to 55%. Lignin contains aromatic compounds and, unlike hemicellulose and cellulose, is a main component of the cell wall (Peng et al. 2012). It has a complex structure, and its role is to hold the hemicellulose and cellulose together. Therefore, the decomposition of this component is more difficult, and it occurred slowly for all samples during the entire temperature range up to 700 °C (Alwani et al. 2013). The residual char of DA species in the B, M, and T portions was 24.49%, 25.79%, and 23.76%, respectively, which was the largest among the species tested as a result of its high lignocellulose content. The char left from the GS and GL species and DP B was approximately 20% to 23%. The lowest amounts of charred residues were observed for DP M (17.69%) and DP T (19.75%). This diversity in the amount of residual char existed due to differences in the chemical composition of the four bamboo species (Alwani et al. 2013). In this TGA analysis, the starting point of decomposition and the onset of degradation for all bamboo species showed that GL species, DP M, and DP T degraded at lower temperatures than GS, DP B, and DA species, which indicated that the thermal stabilities of GL species, DP M, and DP T were lower than those of the rest of the examined bamboo. The comparison of thermal degradation of four bamboo species with other natural fibres can be seen in Table 3. It can be concluded that thermal degradation of DA, DP and GS species commenced at a higher temperature than GL species. Bamboo fibres in comparison with other natural plant fibres have good thermal stability, even better than sugarcane bagasse in the same plant family. Differential scanning calorimetry (DSC) analyses performed on the different portions (bottom, top, and middle) of DP, DA, GL, and GS are shown in Fig. 3 and Table 4. In the DSC analysis, different chemical activities of lignocellulosic fibres occurred as the temperature increased. These activations were presented through a sequence of positive and negative displacements, namely, exothermic and endothermic peaks. For the examined bamboo species and their portions, broad endothermic peaks could be observed in the temperature range of 30 to 135 °C. Negative displacement occurred when heat absorption by the bamboo fibres led to the evaporation of free water located within cellulose. The transition temperature of unbound water or free water in natural polymers is equal to pure water, while it is higher than bound water (Nakamura et al. 1981). From Fig. 3, it can be observed that in the first endotherm, the endothermic peak of DA B (82.82 °C) is the highest and that of GL M (67.10 °C) is the lowest compared to other species and their portions. This peak is also high for GL T (79.56 °C), GS T (79.41 °C), and DP B (79.22 °C). Thus, DA B has the highest lignocellulose content, which was supported by the TGA analysis data in Table 2. 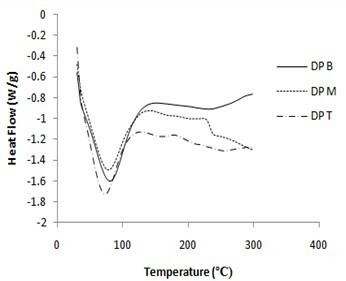 Moreover, the peak temperature of DA B and DA M in the first and second endothermic reactions indicated that the depolymerisation of cellulose molecules followed by volatilisation in these sections of bamboo required higher temperatures due to their higher stabilities, as shown in Table 4. 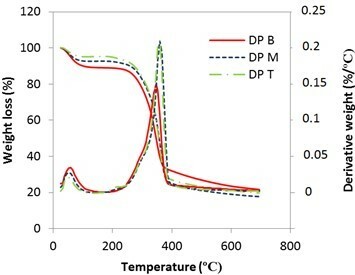 In the regions between 121 and 226 °C for DP M, between 120 and 195 °C for GL B, and between 123 and 189 °C for GS B, no exothermic or endothermic peaks were observed. This indicated that the fibres of DP M, GS B, and GL B were thermally stable in these regions. In contrast, continuous endothermic reactions occurred in DP T and the middle portions of GS and GL species. All bamboo species exhibited two or three continuous endothermic peaks that might be associated with a rapid devolatilisation process (Ball et al. 2008; Glass 1954); an exception to this observation involved GS B and GL B portions that exhibited exothermic reactions after 262 and 234 °C, respectively, which was indicative of the charring process and resulted in little residual material (Yang et al. 2007). The exothermic events in these portions might be related to breakage of cellulose chains in a crystalline region (highly ordered) of their microfibrils. Thermogravimetric analysis and differential scanning calorimetry were used to investigate the thermal degradation behaviour of four types of bamboo species divided into three portions along the length of their stalks. The decomposition of each species varied from bottom to top because of differences in their cellular structures. 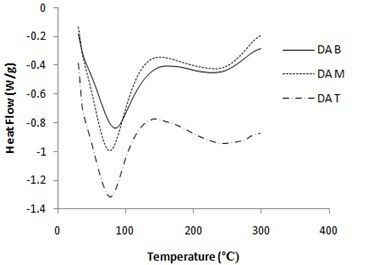 The TG and DTG curves showed a low temperature shoulder (hemicelluloses), a broad peak (cellulose), and an increasing temperature up to the end (lignin). In addition to the degradation of the lignocellulosic components, the early mass loss of bamboo species was related to the dehydration and vaporisation of the moisture content in the fibres. The pyrolysis and major weight loss of Dendrocalamus pendulus (DP), Dendrocalamus asper (DA), Gigantochloa scortechinii (GS), and Gigantochloa levis (GL) species occurred from 292 to 379 °C, 315 to 378 °C, 314 to 374 °C, and 239 to 378 °C, respectively. The obtained results demonstrated that the differences in thermal stabilities of the three portions of every species were insignificant when compared to the differences between species. The thermal stabilities of bamboo species can be ranked DA ˃ GS ˃ DP ˃ GL. The three portions of DA and GS species have suitable properties to be used as reinforcement composite materials in the preparation of polymer composites. The authors are grateful for the support of the Department of Aerospace Research, Grants RAGS-9345400 and FRGS/1/2014/TK04/UPM/02/5/5524499. Ball, R., McIntosh, A. C., and Brindley, J. (2008). “Feedback processes in cellulose thermal decomposition: Implications for fire-retarding strategies and treatments,” Combustion Theory and Modelling 8, 281-291. Eldridge, D. (2013). “Flax weaves its way into cars and aircraft,” Euoropean Plastics News. Haines, P. J. (2002). Principles of Thermal Analysis and Calorimetry, Royal Society of Chemistry. Londoño, X., Camayo, G. C., Riaño, N. M., and López, Y. (2002). “Characterization of the anatomy of Guadua angustifolia (Poaceae: Bambusoideae) culms,” Bamboo Science and Culture 16(1), 18-31. López, O. H. (2003). Bamboo: The Gift of the Gods, Oscar Hidalgo-López Bogotá, Colombia. Yu, X. (2007). “Bamboo: Structure and culture,” Universität Duisburg-Essen. Zakikhani, P., Zahari, R., Sultan, M., and Majid, D. (2014a). “Bamboo fibre extraction and its reinforced polymer composite material,” Int. J. Chem. Mater. Sci. Eng. 8(4), 322-324. Article submitted: August 26, 2015; Peer review completed: October 24, 2015; Revised version received: October 31, 2015; Accepted: November 1, 2015; Published: November 18, 2015.